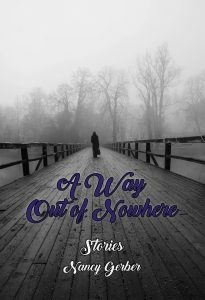 Nancy Gerber is the author of A Way Out of Nowhere, an elegant collection of nine worthy stories. She earned a Ph.D. in English from Rutgers University and a M.A. in Psychoanalysis from the Boston Graduate School of Psychoanalysis-NJ. Her stories have appeared in The New York Times, Mom Egg Review, Adanna, and elsewhere. Gerber writes about relationships among teenagers and young adults, and relationships between teens and their parents, especially between daughters and mothers. She writes with authority, both with regard to her subject matter and with reference to her writing skill. While many of her stories are entertaining, they are perhaps better described as quasi-instructional, in particular, instructive for parents of teenagers. A number of the author’s protagonists are young adults living within less than perfect family situations, many struggling in spite of privileged circumstances. These twenty-first century kids grapple with questions of whom to trust following deception, neglect, and their own misguided efforts at establishing a place for themselves in their worlds. The author writes with empathic understanding of the needs that drive young marrieds or adolescents as they cope with their difficulties. Some are alert to the expectations of their parents, and choose to either honor or defy them. Many of the main characters are victims, of sorts, and most are told through the viewpoint of a female. With economical use of words, Gerber provides brief but adequate descriptions of the settings in which we find the characters—at an ob-gyn office, at the beach, or on the campus, for example. In providing clear sense of place, Gerber also conveys added information within the brief introductory scenes that allows the reader deeper understanding of the characters. Hannah, in the memorable “The Angry O,” tries to cope with her sleep deprivation (and likely post-partum depression) during the first two months following her baby’s birth. Her husband returns home to discover Hannah’s unusual solution to her fatigue. In this, as in other stories, the author proffers a most plausible and surprising ending. Gerber’s well-crafted endings, in fact, are what add to the satisfactions of this volume. They are sometimes open-ended, but never hackneyed. Two stories that fall at the opening and closing of the collection justify the book’s title. In the initial story, Laura, a first-year college student, meets older student, Jake, a Vietnam War vet. Eager for a sexual relationship, Laura consults a Planned Parenthood doctor to be fitted for a diaphragm. She craves the self-affirmation she’d feel from gaining this older partner. Jake communicates his need for escape, through literature, from lingering war torments. “I feel like I’m nowhere and there’s no way out,” he states. (16) The reader can readily understand the needs that drive these two toward a relationship. That relationship, though, takes an unusual and unexpected turn. In the final story, one of the most endearing, Eva is often left alone at home. Her father, divorced from her mother, goes off to live with his new family far across the country. Eva’s anger and emptiness sparks her turn to shoplifting. An event, though painful, brings her new perspective and unexpected healing. In this conclusion, Gerber gives Eva and her new friend exactly what the collection’s title promises: a way out of nowhere. My only criticism of the author’s technique is that she presents a sometimes too-tidy psychological understanding of her characters. The reader begins to suspect (s)he’s encountered a well-constructed composite while wanting to “meet” a singular human being. However, Hannah and Eva are two figures that more than transcend any limitations of characterization. Furthermore, an artist may surely be justified in using composites to convey intended meanings through modeling of types. It’s likely Gerber had didactic purposes in mind. In sum, all of these stories are commendable for their revelations and are well worth reading. Carole Mertz critiques poetry and prose for various literary journals, including most recently at Eclectica, Mom Egg Review, and South 85 Journal. Her recent essays on writing are in MER and at Working Writer. As an early reader, she assessed poetry submissions to Women’s National Book Association’s 2018 Poetry and Prose Contest. 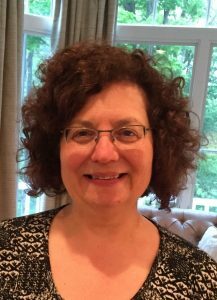 Carole resides with her husband in Parma, Ohio, where she teaches music to young children.